Say: O people of God! Adorn your temples with the adornment of trustworthiness and piety. Help, then, your Lord with the hosts of goodly deeds and a praiseworthy character. We have forbidden you dissension and conflict in My Books, and My Scriptures, and My Scrolls, and My Tablets, and have wished thereby naught else save your exaltation and advancement. Unto this testify the heavens and the stars thereof, and the sun and the radiance thereof, and the trees and the leaves thereof, and the seas and the waves thereof, and the earth and the treasures thereof. We pray God to assist His loved ones, and aid them in that which beseemeth them in this blest, this mighty, and wondrous station. Moreover We beseech Him to graciously enable those who surround Me to observe that which My Pen of Glory hath enjoined upon them. Whatsoever people is graciously favored therewith by God, its name shall surely be magnified and extolled by the Concourse from on high, by the company of angels, and the denizens of the Abhá Kingdom. And whatsoever people turneth its heart away from this Divine Love—the revelation of the Merciful—shall err grievously, shall fall into despair, and be utterly destroyed. That people shall be denied all refuge, shall become even as the vilest creatures of the earth, victims of degradation and shame. No sooner had her voice reached that most exalted Spot than We made reply: “Render thanks unto thy Lord, O Carmel. The fire of thy separation from Me was fast consuming thee, when the ocean of My presence surged before thy face, cheering thine eyes and those of all creation, and filling with delight all things visible and invisible. Rejoice, for God hath in this Day established upon thee His throne, hath made thee the dawning-place of His signs and the dayspring of the evidences of His Revelation. Well is it with him that circleth around thee, that proclaimeth the revelation of thy glory, and recounteth that which the bounty of the Lord thy God hath showered upon thee. Seize thou the Chalice of Immortality in the name of thy Lord, the All-Glorious, and give thanks unto Him, inasmuch as He, in token of His mercy unto thee, hath turned thy sorrow into gladness, and transmuted thy grief into blissful joy. He, verily, loveth the spot which hath been made the seat of His throne, which His footsteps have trodden, which hath been honored by His presence, from which He raised His call, and upon which He shed His tears. Bahá’u’lláh(1) appeared at a time when the Persian Empire was immersed in profound obscurantism and ignorance and lost in the blindest fanaticism. It was at this time that Bahá’u’lláh appeared. His father was one of the viziers, not one of the ulamá. As all the people of Persia know, He had never studied in any school, nor had He associated with the ulamá or the men of learning. The early part of His life was passed in the greatest happiness. His companions and associates were Persians of the highest rank, but not learned men. As soon as the Báb became manifested, Bahá’u’lláh said, “This great Man is the Lord of the righteous, and faith in Him is incumbent upon all.” And He arose to assist the Báb and gave many proofs and positive evidences of His truth, in spite of the fact that the ulamá of the state religion had constrained the Persian government to oppose and resist Him and had further issued decrees ordering the massacre, pillage, persecution and expulsion of His followers. In all the provinces they began to kill, to burn, to pillage the converts and even to assault the women and children. Regardless of this, Bahá’u’lláh arose to proclaim the word of the Báb with the greatest firmness and energy. Not for one moment was He in concealment; He mixed openly with His enemies. He was occupied in showing forth evidences and proofs and was recognized as the Herald of the Word of God. In many changes and chances He endured the greatest misfortunes, and at every moment He ran the risk of being martyred. In spite of all this He never ceased for one instant His proclamation of the greatness of the Cause of God. He manifested such virtue, knowledge and perfections that He became a wonder to all the people of Persia. So much so that in Tehran, Baghdád, Constantinople, Rumelia, and even in Akká, every one of the learned and scientific men who entered His presence, whether friend or enemy, never failed to receive the most sufficient and convincing answer to whatever question was propounded. All frequently acknowledged that He was alone and unique in all perfections. They proceeded to use violence toward Him to oblige Him to ask for permission to leave Persia, thinking that by this means the light of His truth would be extinguished, but the result was quite the contrary. The Cause became magnified, and its flame more intense. At first it spread throughout Persia only, but the exile of Bahá’u’lláh caused the diffusion of the Cause throughout other countries. Afterward His enemies said, “Iraq-i-Arab(4) is not far enough from Persia; we must send him to a more distant kingdom.” This is why the Persian government determined to send Bahá’u’lláh from Iraq to Constantinople. Again the event proved that the Cause was not in the least weakened. Once more they said, “Constantinople is a place of passage and of sojourn for various races and peoples; among them are many Persians.” For this reason the Persians had Him further exiled to Rumelia; but, when there, the flame became more powerful, and the Cause more exalted. At last the Persians said, “Not one of these places is safe from his influence; we must send him to some place where he will be reduced to powerlessness, and where his family and followers will have to submit to the direst afflictions.” So they chose the prison of Akká, which is reserved especially for murderers, thieves and highway robbers, and in truth they classed Him with such people. But the power of God became manifested: His word was promulgated, and the greatness of Bahá’u’lláh then became evident, for it was from this prison and under such humiliating circumstances that He caused Persia to advance from one state into another state. He overcame all His enemies and proved to them that they could not resist the Cause. His holy teachings penetrated all regions, and His Cause was established. Indeed, in all parts of Persia His enemies arose against Him with the greatest hatred, imprisoning, killing and beating His converts, and burning and razing to the ground thousands of dwellings, striving by every means to exterminate and crush the Cause. In spite of all this, from the prison of murderers, highway robbers and thieves, it became exalted. His teachings were spread abroad, and His exhortations affected many of those who had been the most full of hatred, and made them firm believers. Even the Persian government itself became awakened and regretted that which had arisen through the fault of the ulamá. Upon His arrival in prison(5) He addressed an epistle to Napoleon, [Napoleon III.] which He sent through the French ambassador. The gist of it was, “Ask what is Our crime, and why We are confined in this prison and this dungeon.” Napoleon made no reply. Then a second epistle was issued, which is contained in the Súriy-i-Haykal. (6) The epitome of it is: “Oh Napoleon, as thou hast not listened to My proclamation, and as thou hast not answered it, thy dominion will before long be taken away from thee, and thou wilt be utterly destroyed.” This epistle was sent to Napoleon by post, through the care of Cesar Ketaphakou(7), as was known to all the companions of His exile. The text of this warning reached the whole of Persia, for it was at that time that the Kitáb-i-Haykal was spread in Persia, and this epistle was among the contents of this book. This happened in A.D. 1869, and as this Súriy-i-Haykal was circulated in Persia and India and was in the hands of all believers, they were waiting to see what would come to pass. Not long after, in A.D. 1870, the war between Germany and France broke out; and though no one at that time expected the victory of Germany, Napoleon was defeated and dishonored; he surrendered to his enemies, and his glory was changed into deep abasement. 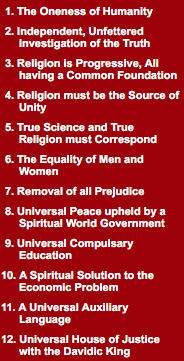 So also foreign peoples, and other sects who were not believers, attributed many wonderful things to Bahá’u’lláh. Some believed that He was a saint(9), and some even wrote treatises about Him. One of them, Siyyid &Davudi, a Sunnite savant of Baghdád, wrote a short treatise in which he related certain supernatural acts of Bahá’u’lláh. Even now, in all parts of the East, there are some people who, though they do not believe in His manifestation, nevertheless believe Him to be a saint and relate miracles attributed to Him. To sum up, both His antagonists and His partisans, as well as all those who were received in the sacred spot, acknowledged and bore witness to the greatness of Bahá’u’lláh. Though they did not believe in Him, still they acknowledged His grandeur, and as soon as they entered the sacred spot, the presence of Bahá’u’lláh produced such an effect on most of them that they could not utter a word. How many times it happened that one of His most bitter enemies would resolve within himself, “I will say such and such things when I reach His presence, and I will dispute and argue thus with Him,” but when he entered the Holy Presence, he would become amazed and confounded, and remain speechless. Bahá’u’lláh had never studied Arabic; He had not had a tutor or teacher, nor had He entered a school. Nevertheless, the eloquence and elegance of His blessed expositions in Arabic, as well as His Arabic writings, caused astonishment and stupefaction to the most accomplished Arabic scholars, and all recognized and declared that He was incomparable and unequaled. If we carefully examine the text of the Torah, we see that the Divine Manifestation never said to those who denied Him, “Whatever miracle you desire, I am ready to perform, and I will submit to whatever test you propose.” But in the Epistle to the Sháh, Bahá’u’lláh said clearly, “Gather the ulamá, and summon Me, that the evidences and proofs may be established.”(10) For fifty years Bahá’u’lláh faced His enemies like a mountain: all wished to annihilate Him and sought His destruction. A thousand times they planned to crucify and destroy Him, and during these fifty years He was in constant danger. Christ, in His blessed day, in reality only educated eleven men: the greatest of them was Peter, who, nevertheless, when he was tested, thrice denied Christ. In spite of this, the Cause of Christ subsequently permeated the world. At the present day Bahá’u’lláh has educated thousands of souls who, while under the menace of the sword, raised to the highest heaven the cry of the Most Great Name and in the fire of tests, their faces became illuminated like gold. Then reflect what will take place in the future. (1) Jamál-i-Mubarak, the Blessed Beauty, the title which is here given to Bahá’u’lláh. He is also called Jamál-i-Qidam, the Preexistent, or Ancient Beauty. But we shall designate Him as Bahá’u’lláh, the title by which He is known in the West. (2) Exiled first to Baghdád, then to Constantinople, then to Adrianople, He was imprisoned in Akká (Acre), “the Greatest Prison,” in 1868. (3) The penetrating judgment of Bahá’u’lláh upon this occasion overcame the malignity of His enemies, who, it was certain, would never agree in choosing what miracle to ask for. (4) Iraq; as opposed to that district of Iran known then as Iraq-i-Azam and now called Arak. 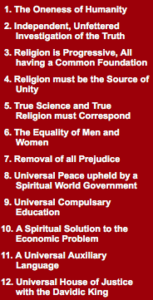 (6) One of Bahá’u’lláh’s works written after His declaration. (7) Son of a French Consul in Syria with whom Bahá’u’lláh had friendly relations. (8) Name given to the epistles of Bahá’u’lláh. (10) Cf. p. 30, n.1. In giving such importance to this example of the good sense of Bahá’u’lláh, `Abdu’l-Bahá means to emphasize the uselessness of miracles as a proof of the truth of the Manifestations of God. Cf. “Miracles,” p. 100. You are currently browsing the Baha'i Justice blog archives for May, 2017.